This article originally appeared on our premium research service GigaOM Pro (subscription required). I liked a couple of things about this one. First was the fact that Schweikert is factually incorrect. Solar Trust never took any government money, even though it was offered a DOE loan guarantee. The other thing I liked was the rare acknowledgement that yes, the federal government subsidizes the oil industry through tax breaks. I recently spoke with Roger Bezdek, a 30-year energy consultant who at one point directed energy research at the Department of Energy, and who briefed the McCain and Obama staffs on energy policy during the 2008 election. 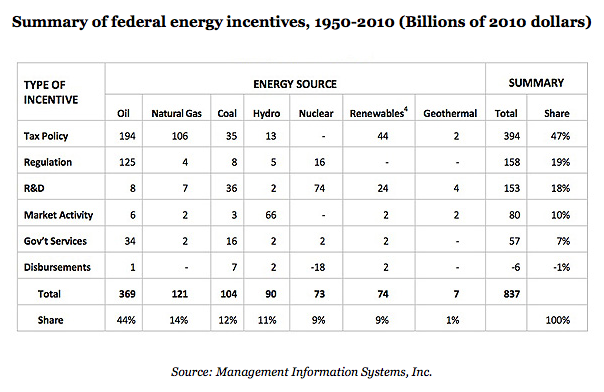 During his long career Bezdek has done the painstaking work of analyzing the U.S. government’s energy incentives for all industries, from oil to solar, going back 60 years to 1950. This involves doing things like going over more than half a century of Office of Management and Budget (OMB) budgets as well as incorporating policy decisions and budgets from individual agencies like the Department of the Interior to get a complete view of how the government supports certain energy sectors. Bezdek’s 59-page report, which he did for the Nuclear Energy Institute last October, found $837 billion (in 2010 dollars) in incentives were expended over the past 60 years with oil, coal and natural gas getting 70 percent of that, or $594 billion. Oil alone was the big winner with $369 billion by itself while renewable energy, defined primarily as solar and wind, has received $74 billion, about what nuclear has received. These historical figures are instructive during an election year in which incentives for clean energy are under constant political attack. We can have ideological debates about the role of government in financing energy development—whether it should only be supporting research and development programs like ARPA-E or whether there’s a role for it to play in picking sectors and companies with programs like loan guarantees, tax credits, or tariffs—but we cannot dispute the fact that the government has been providing incentives for over sixty years, primarily to fossil fuel industries. And this raises secondary questions: Are the oil, coal and natural gas industries where they are today because of historical subsidies? And where would we be in 60 years if we subsidized renewable energy the way we have subsidized fossil fuels over the past 60 years? The answer to this first question tells us a great deal about how fundamentally differently we have to look at renewable energy incentives versus fossil fuel incentives. Even if the fossil fuel industries received a boost from subsidies, today’s price of oil, no doubt, has not been much impacted by historical subsidies precisely because oil exists in a global market where prices spikes have been driven by surging demand in India, China and Indonesia. But renewables are not, by and large, governed by pricing volatility in natural resources because their fuel—wind, sun, geothermal—is free. Meaning any subsidies that improve upon and lessen the price of the technology that produces renewable energy should hold up over time, which isn’t true of incentives for fossil fuels. You can design a better oil rig but demand for the underlying fuel remains the driver of price, unless you take drastic market intervention steps like the ones Venezuela takes, selling gas for as little as 12 cents a gallon. A solar panel that is twice as efficient, however, should stabilize future energy prices downward. The answer to the second question of where we might be say, if we dumped four or five hundred billion dollars in incentives into renewables over the next half century, is unknowable but we can assume that prices would come down, just as they have over the past 20 years with the modest incentives provided. For the record, people like Bezbek are firmly in the Bill Gates camp of not believing that market interventions like tariffs work, and we’re clearly seeing some of the problems as the rollback on solar tariffs in Europe is hurting the solar industry. These folks all want to keep government support limited to research and development, even if those solutions are unlikely to have a major near term effect on greenhouse gas emissions. With most governments facing debt problems, it’s unlikely that any energy sector will see significant subsidies in the next ten years. When asked whether the renewable energy industry deserved its shot at subsidies, Bezbek said “the idea that oil got a hundred billion dollars, and we [renewable energy] want a hundred billion, is simply not going to fly.” But as we think about how we got to the place we’re in—increasing energy prices, growing greenhouse gas emissions, a wholesale move of the U.S. energy economy toward natural gas—we might just keep in historical perspective, which energy sectors have really taken the lion share of government help. And if everyone can’t agree on intervening in the market with tariffs, we could all agree that the government should make very large R&D investments to remove as much technology risk as possible so that renewables can get to market. Adam – you have gone farther than most with this analysis, THANK YOU. That said, could you go about estimating the number of units of energy produced in the projects subsidized? And could you then speculate as to the dollars of subsidy paid per unit of energy? Keep up the great work. Cr, that granular analysis is something that would be very worthwhile. There would be cases like the breeder reactor program, where no energy was produced, programs like the section 1603 cash grants for renewables where we really can know how many watts of energy resulted, and then there are more complicated estimates like what the impact of the oil industry being able to write off intangible drilling costs really is (some energy would have been produced with or without an incentive). But yes, it would be a large research project….maybe someday Roger would be so kind as to tackle it.